7. Induction, induction, what's your function? "My Wife and My Mother-in-Law". Epistemology examines the nature of knowledge. It asks (and attempts to answer) such question as: Is knowledge possible? What is its source, or sources? How do we acquire it? Is knowledge some kind of belief, and If so, what kind? What justifies a claim that some piece of information really is honest-to-goodness knowledge? These questions have been debated by philosophers since ancient times, and (because of their fundamental role in the writing of Rene Descartes) are built into the heart of modern philosophy. Moreover - given the range and extent of the claims to knowledge made by human beings - the issues raised by epistemology spill over from academic discussion to touch many aspects of our existence. This course falls into two parts. In the first part (the first seven lectures) we will be examining classical philosophical issues surrounding knowledge and justification. In particular, we will discuss skepticism (the claim that knowledge isn't possible), examine the idea that knowledge is a certain kind of belief (namely, a 'justified true belief'), discuss a priori knowledge (beloved by rationalists) and perceptual knowledge (friend of empiricists) and survey competing accounts of the structure of justification (internalism versus externalism, and foundationalism versus coherentism). But the classical account of knowledge has certain shortcomings. For a start, it takes a rather abstract view of human beings: they are 'knowers', seemingly concerned only with isolated pieces of information. Furthermore, these knowers look rather lonely: the social interactions that play such an important role in how we come to know are conspicuous by their absence. Accordingly, in the second part of the course (the last three lectures) we will turn to accounts of knowledge that draw in deeper ways on human experience. In particular, we will discuss Thomas Kuhn's account of the social aspects of scientific knowledge, and Linda Zagzebski's work linking epistemology with Aristotelian virtue ethics. Epistemology is a huge subject. It has been around since antiquity and keeps on developing fast. Recent work in social epistemology, formal epistemology, and feminist epistemology (to mention only three major directions) are likely to profoundly affect the way philosophers (and others) think of epistemological issues. While this course cannot introduce you to all these developments, my hope is that it will provide you with a map and compass that will be a useful guide when you begin your own epistemological explorations. Induction, induction, what's your function? In an introductory course like this, textbooks have an important role to play: they enable enable a wider terrain to be covered fast, and introduce novel terminology in a gentler way than is possible in research papers. Here's a partial list, with comments. Do browse through some of these, and try and find one that you feel comfortable with. 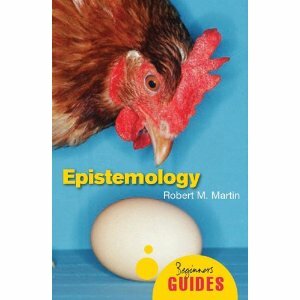 The most detailed epistemology textbook I know of. Excellent, though possibly too demanding for a first encounter with the subject. Detailed and well worth consulting: many chapters can (more or less) be read as stand-alone articles. Interesting, opinionated, and reasonably readable introduction to the subject written by a pioneer of coherentism who later turned to foundationalism. Historically informed, with useful discussion of the work of Descartes. An excellent introduction, but definitely one you wrestle with rather than gliding gently through. Written earlier than the other texts discussed here, it has a quite different flavour. Thought provoking and chockful of argumentation. By far the shortest text considered here - more a quick survey than a textbook. Written clearly and straightforwardly, it offers (and delivers) a bite-sized overview of the basics of the field. Excellent expository writing. Probably the best as a first approach to the field. Clearly written, and with many references to film and literature to help clarify abstract ideas. The most mixed of the bunch. Some chapters are detailed, punchy, and tautly argued; others are curiously flat. Worth looking at, but be selective. Strictly speaking, not a text book, but it's not an ordinary collection of papers either. Rather, it is made up of pairs of short articles; each pair debates an important epistemological issue (such as Can Skepticism be Refuted?). Well worth looking at. In the last part of this course, we will be be discussing the following two books. A book which revolutionized Philosophy of Science, and much else besides. An important source for the social and historical approaches that are now becoming increasingly important in epistemology. Beautifully argued book in which modern epistemology meets Aristotelian virtue ethics and both parties come out winners. Textbooks are helpful, but reading original papers is vital. Good anthologies can be useful here. Well balanced collections, especially when accompanied by sensitive editorial exposition, make it easier to cross the bridge into the (often forbidding) world of contemporary research work. A collection of 41 articles, addressing five broad areas of epistemology, with each area carefully introduced by the editors. At over 600 pages, this will not merely introduce you epistemology, it will immerse you in it. And this collection, at over 900 pages is even bigger, and in some ways better...happy swimming! Reference books can be a useful way in to new terrain, giving you a quick start to who's who and what's what. A useful reference. Clearly organized, and fun to browse in.